The P-series workstations were designed for the "engineering, architecture, finance, media & entertainment markets". These are businesses (and individuals) require reliable and fast workstations in order to get their work done accurately and on time. 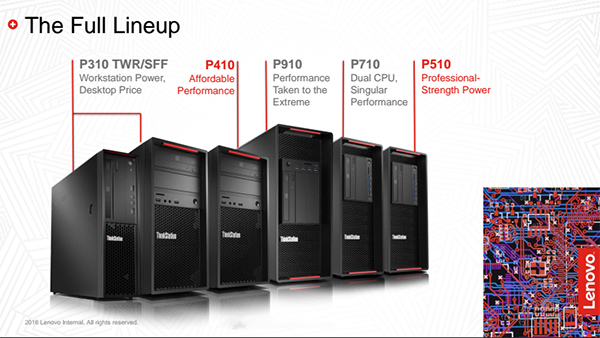 Lenovo has positioned its P-series to accomodate users of a mainstream entry level workstation all the way up to the high end P910 model. The new P410 workstation is Lenovo's mainstream entry level model (their true entry level workstation is the P310), but that doesn't it mean it lacks power or speed. Beautifully designed hardware with easy expansion capability and tool-less construction. I primarily do video production, modeling, 2D animation and writing/formatting using applications like Adobe CC, Maya, Cinema 4D and Photoshop. Having built my own self-designed workstation for years, I was interested to see how the P410 affected my daily workflow. The P410 workstation rendered my weekly video projects (all at 720p and with multiple effects) in better than three-quarters of the time. My workstation takes 2:34 to render in Adobe Media Encoder; the P410 took the same project and rendered it in 41 seconds. And I'm using a NVIDIA Titan X GPU, too. I tried pushing the rendering by creating an 86GB video project and rendered it as an uncompressed avi. The P410 took just 4:30 to render this project. That is phenomenal power and speed. Overall, the P410 gave me a decrease of nearly 75% of time and effort in all of my weekly/daily tasks, which is a phenomenal impact for an entry level workstation. Practically everything I threw at this workstation simply flew by in rendering. At one point, I tried to overload the system with multiple applications, browsers, online video and running a video game all at the same time: nothing could slow down or cause the P410 to stutter. Just for the record, my geekbench scores were excellent (cpu=20,000, gpu open cl=66,300). Maxon Cinebench scores were equally good: cpu=1173, gpu open gl=160fbs). All of these scores are in the top percentiles in each database, but then we already know that the cpu/gpu combination in the P410 are going to score high in tests. We know that this workstation will reduce rendering and work times, but what other things can it do to make your work easier and faster? The metal chassis and excellent airflow design keep the interior of the P410 cool even under heavy workloads. And the system is easily expandable; you can go up to 128GB of ECC memory (4 slots with up to 32 GB sticks) and the system can expand to 4 PCI slots with a wide variety of storage options from M.2 SSD's to SAS drives. If you want to add additional monitors, the Quadro M4000 has 3 additional digital outlets. I like the optional FLEX bay which can support a variety of drives from front eSata to an additional optical drive. Another example of Lenovo's efforts to make the user's experience easier. I use external drives in a lot of my video work and the ThinkStation P410 makes it easy to accomodate these drives. 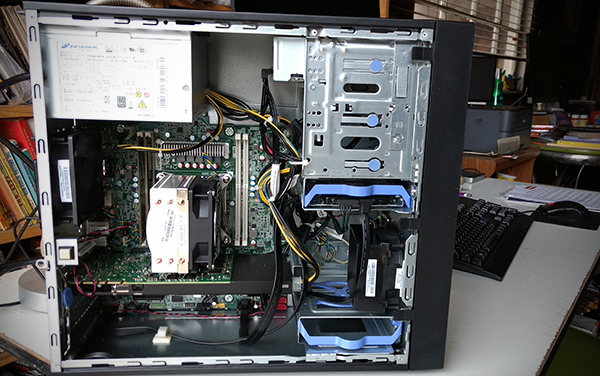 There are 4 USB 3.0 ports, 2 USB 2.0 ports on the back of the workstation along with two more USB ports, a 9-1 card reader with audio in/out on the front of the computer. I highly recommend the P410 to anyone looking to buy their first workstation or for professionals looking for a great balance between power and price. The Lenovo ThinkStation P410 is the best single cpu, entry-level workstation I've ever reviewed. It's classy looking, well-designed and is powerful/fast enough for any professional workload. The acid test for a workstation is that it will save you time and make your job easier. In every instance, my own work was faster and made much easier by the P410 workstation. There is some room for improvement, however, a wifi-card does not come standard (I had to buy a usb network card to connect to my home wireless network). You can add a wifi-card when you create your build if you like, but this should be included with the base unit. Also, the DVD rw drive is generic and fairly slow compared to many other models out there. And finally, while the entry level price for the P410 ($1,043.10) is cheap, once you start adding ssd drives and a Quadro card the price starts zooming up. The base model could be beefed up a bit in order to be even more competitive with other workstation companies. However, the balance between power and affordability is very high with this workstation. Lenovo is doing a great job here and it's easy to see why they are giving other workstation manufacturers a challenge. Lenovo makes it easy for you to create the P410 build that works just right for your financial needs as well as your power/speed needs in a workstation. If I were to purchase a mainstream entry level workstation, I'd choose Lenovo and in particular the ThinkStation P410. I highly recommend the P410 to anyone looking to buy their first workstation or for professionals looking for a great balance between power and price. The unit reviewed came with the higher end Xeon E5-1650 v4 @ 3.60 GHz and the NVIDIA Quadro M4000 GPU combination along with a 1TB SSD drive. The price for this review unit is $1950. You can, however, make your own combination of components starting with the base unit which costs $811.30. The Lenovo website is very easy to use and I recommend that you research the power you need for your own workflow before you create your own version of the P410. Note: the review unit of the ThinkStation P410 came with the outstanding ThinkVision P27 27" Wide UHD IPS monitor. Although I'm not reviewing the monitor here, I do want to say that it was a pleasure to use. Rivaling the Retina displays on my Macbook Pro, the P27 brought crystal clear images, crisp and readable text and is very easy to set up and use. This monitor would make a great combination with the P410. You can find out more info on the P27 monitor here.